Congrats to Katie of Live Half Full for winning the free race entry to Hot Chocolate 15/5k. She's going to do the one in Chicago on Nov. 3 with me! There's still time to register for Chicago but do it quickly because the race is selling out! Use code HealthyfitMUG to get a free travel mug when you register. You can also get awesome swag on the race website, like the super soft shirt I'm wearing below. My personal favorite is the ear warmer, a must for Chicago weather! The Hot Chocolate 15K is just two weeks away and I don't really know how to train or prepare for it after the Chicago Marathon. My ankle was still bothering me last week so I didn't run and did Bikram yoga and crossfit instead. My ankle feels better now and my muscles/joints aren't sore anymore so I'm going to try to do a shorter run this week, about 5 miles, and then a longer 8-10 mile run this weekend. Next week, I'll have to take it easy on crossfit workouts so I'm not sore on race day. My time for the 15K last year was 1:18:52 and I want to beat it! Are you doing another race this year after your fall half or marathon? How are you preparing for it?? Disclaimer: I am part of the Hot Chocolate 15/5K blogger program and got a free race entry and sway for writing about the race. All opinions and text are my own. 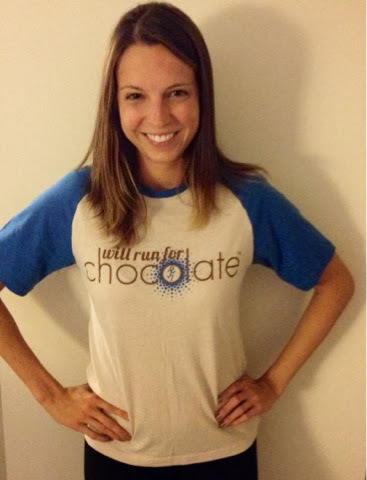 I'm running the Hot Chocolate 15K in Chicago too... maybe I will see you! I'm in Corral E and my goal time is under 1:20 (under 8:35/mi). You can totally PR! Best of luck!